street artist unlike any other, DAKU is famously known as India’s Banksy. Holding on to his anonymity the way creatives that do not give a single dime for the celebrity status do DAKU the artist is best known for his provocative works that speak volumes and his latest public artwork which he presented as part of Delhi’s recent street festival was unique. This typographic installation begged to differ by using the element of sunlight. The sun brought this project to life and everyone was amazed. Street art is transforming our habitat and letters were there to spell DAKU’s message to the world. Aptly called “Time changes everything”, the typographic installation used the sun as numerous shadows reflected on the concept of time. 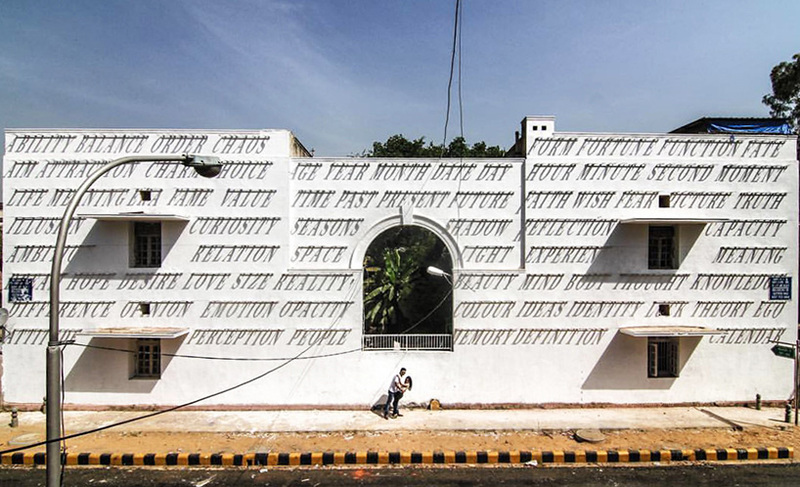 Comprised of a series of cut-outs of words mounted on the walls that change their to form the message (words that speak of all those things that change with time such as love, seasons, wisdom and perception) this typographic piece was a marvel to look at each and every day under the Indian sky. “This typographic piece by DAKU ingeniously visualises the concept of time by playing with letters and shadows. The oldest forms of measuring time were sundials used by the Egyptians as early as 1500 BC, and this piece takes that concept to a whole new level” writes St+art India. “By mounting several words on the wall which cast an evolving shadow through the day, the artist speaks metaphorically of all the things in life which change over time. The words highlighted in this piece not only speak of the nature of our lives but also the ephemeral nature of street art - which is constantly changing”. “Every day, throughout the year, this piece will come alive between 09:30 AM to 14:30 PM, after which it will disappear with the fading sun. The best time to view the wall is at 12:00 (noon) when the shadow falls directly on the wall making the words clearly legible. As time passes, the slant of the shadow increases making them slowly fade away as the sun sets. The work will NOT be visible between 15th May to 15th August as there won’t be any shadow on the wall”. DAKU spent almost a month studying the way the sun falls on the wall and read up extensively on sundials, before finally making the piece. “The work is changing, the wall is changing. Everything around us is changing constantly. That’s the law of the universe” he says to Mashable. Installed in New Delhi’s Lodhi Colony, which is referred to as India’s first public art district, “Time changes everything” proves although everything changes indeed, people do communicate through typography since forever. This typographic artwork of the man and the sun will be ours again after the 15th of August, when the sun will change its direction.